2017 Nara Summit information from former JASSC president Paul Maruyama. 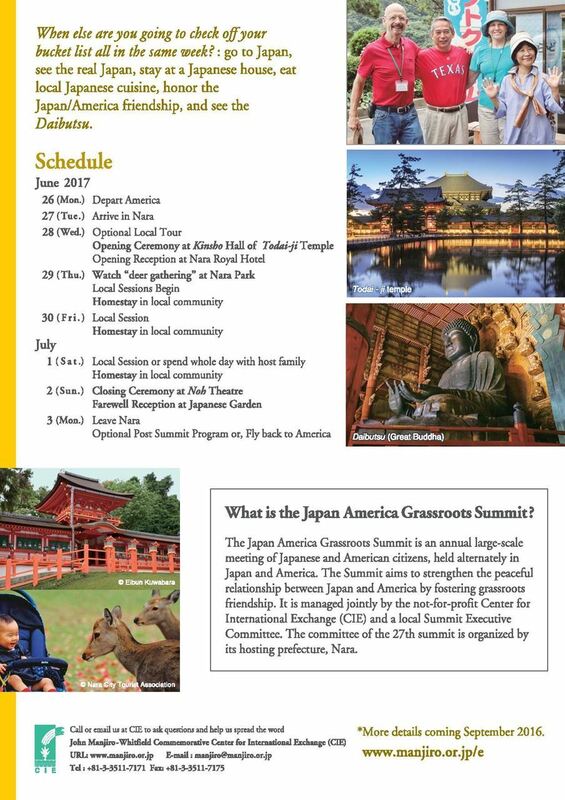 I am sure that most of you are familiar with the Japan-America Grassroots Summits (Manjiro Summit) which are held annually, hosted alternately in the U.S. and in Japan. 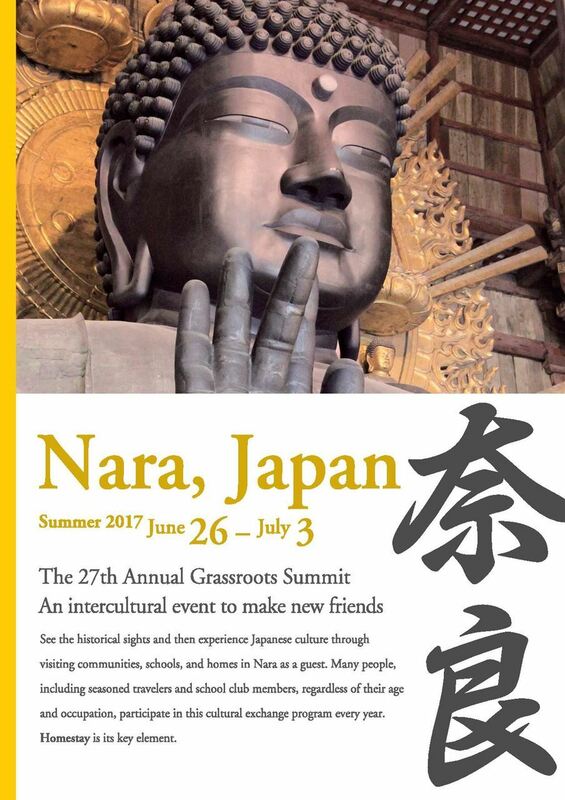 The 2017 Summit (the next Summit to be in Japan) will be held from June 26 - July 3, 2017, in Nara, the most ancient capital of Japan. Nara is located next door to Kyoto. The Manjiro Summit is a grassroots exchange meeting which aim to strengthen friendship between the people of Japan and of the United States. The most important part of the Summit is the homestay program: You will have the opportunity to stay in the home of a Japanese family for three days and develop a friendship with your host family that will last a lifetime. As a participant of the Summit, you are not simply a tourist in Japan- you are a special guest of the host family, of the people of Nara, and of the people of Japan. You will have the opportunity to enjoy and get to know Japan, her culture, and her people in ways that no tourist can experience. The Manjiro Summit is probably the most economical way to visit Japan because of the homestay opportunity and because the people of Nara will roll out the red carpet for YOU, their special guest. (As a concrete example of what I'm talking about, the Opening Ceremony for the Nara Summit will be held in the most famous Todaiji Temple in Nara, an opportunity hardly any native Japanese will ever experience!). Participation in the Manjiro Summit is open to anyone (regardless of age, occupation, gender, religion, etc.) who has a genuine interest in Japan and in fostering friendship with the people of Japan. The Nara Summit will be the 27th annual event. JASSC is proud to "brag" that we have hosted the Summit twice in the past, in 1996 and in 2006. I know many of you were involved and I thank all of you who helped make the Summits a resounding success. I am especially grateful to those of you who volunteered as host families. The purpose of this e-mail is to plant a seed in each of you to consider traveling to Japan next summer to be a part of the Manjiro Summit. More detail, such as price for participation (including airfare which is usually discounted), what to expect, etc,, will be forthcoming as they are finalized in Japan. Please look over the attached flyer or go to http://www.manjiro.or.jp/e/activities/index.html for more detail on what the Summit is all about. More information is now available including prices. Please feel free to contact me at pmaruyama@earthlink.net if I can answer any questions for you. And, please pass this invitation on to your non-JASSC member friends, fellow students, and neighbors who have dreamed of visiting Japan.